For all of you mycologists and mycophagists out there, how reliable are these general guidelines for mushroom foraging? Does this spell certain death? Or will we, the gentle reader, be enjoying a lovely sauteed mushroom repast? 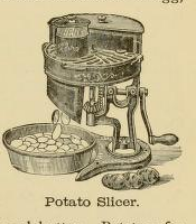 Source: Mrs. Crowen’s American Lady’s Cookbook, 1866. These instructions don’t seem to be in enough depth for my comfort level. That said, we did enjoy a delicious pasta dinner made with chanterelles a friend harvested in the Santa Cruz mountains. We asked a local restaurant owner friend to check them to help us feel like we should go ahead and use them. BUT–each season people foraging here get sick or die! Usually, they have traveled from other countries and aren’t familiar with the species here, I guess. Mostly, I’d rather buy them at the farmer’s market after a nice walk in the woods…. Here here! I’m all for the farmer’s market.